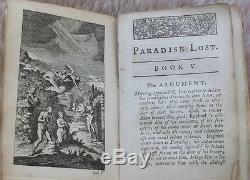 Paradise Lost, a Poem in Twelve Books. 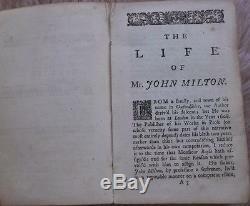 Printed in London for J & R Tenfon and S Draper etc in 1746. 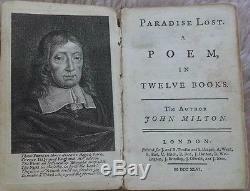 Contains frontis illustration of John Milton and Life of John Milton by Elijah Fenton. 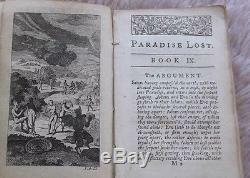 This firft book propofes, firft in brief, the whole fubject, man's disobedience, and the lofs thereupon of Paradife wherein he was placed. 3.25 x 5.25 inches. 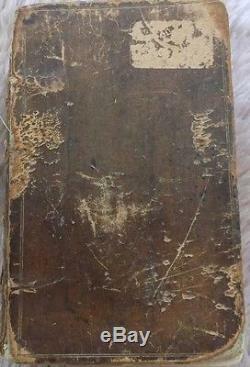 Front cover detached, only parts of spine remaining and no back cover. 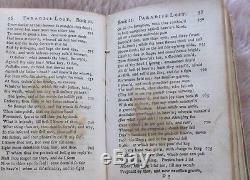 Some tears to page edges, small holes to a few pages and contents loose/detached. Browning and marking to pages. 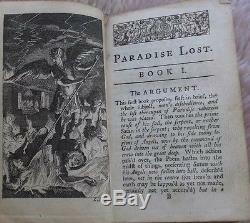 Book split in several parts. 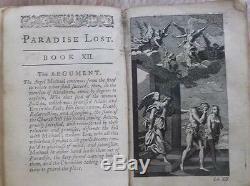 The item "1746 Antique Very Rare Book Paradise Lost, a Poem in Twelve Books by J.
Milton" is in sale since Wednesday, December 14, 2016. 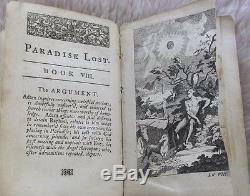 This item is in the category "Books\Antiquarian & Collectible".15" and is located in Olivehurst, California.